A part-time option is available as well, which takes 36 months to complete. Students must complete between 42-54 credits to complete the program, depending on waiver availability. The Rutgers University Traditional MBA curriculum consists of 54 credits: 15 courses worth 45 credits comprise the core and nine credits are gained through electives. Within the core, four courses may be waived, which translates to 12 credits. These courses are Managerial Economics, Managerial Skills, Quantitative Skills and Accounting for Financial Reporting. Waivers are granted when comparable coursework has been completed within the last ten years at a four-year accredited institution. RSBC does not grant waivers for coursework completed at a community college or for related professional experience. Finally, to round out the curriculum, students must complete three elective courses. Electives fall into one of five concentrations: entrepreneurship, finance, marketing, management or international business/operations. Students may also fulfill the elective requirement by taking classes at the School of Law in Camden after gaining approval from the Associate Dean of the School of Law. In addition, Traditional MBA students may participate in the South Africa Study Project, held each year during spring break. During this 12-day trip, 25 MBA and RSBC undergraduate students travel to South Africa and visit local businesses and government officials. Students must apply to participate, and those who complete the trip receive three credits. There are currently 82 students in the RSBC Traditional MBA program. These students are, on average, 30-years old, join with nine years of previous work experience and are majority female (56 percent). The GMAT average is 550. As Rutgers is a state university, RSBC posts different tuition rates for New Jersey residents and out-of-state residents. 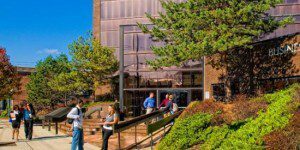 For the current academic year, tuition for NJ residents attending the School of Business Traditional MBA is $974 per credit, which equates to $52,596 over 54 credits. Tuition for out-of-state residents is $1,650, which brings the total to $89,100. Applicants to the Rutgers University-Camden Traditional MBA program are required to submit the following: the online application form, a $70 application fee, original undergraduate and graduate transcripts if applicable, two letters of recommendation, a personal statement of the applicant’s career objectives, GRE or GMAT scores, and a current résumé. Applicants who hold a graduate degree, such as a JD, MD, or Ph.D., are not required to send their standardized test scores to Rutgers. In addition to these materials, international applicants must submit their TOEFL, IELTS or PTE scores and a statement of financial documentation. Indian applicants should note that the RSBC admissions committee considers Division I or II bachelor’s degrees, earned in three years at “A” grade, NAAC-accredited college in India to be equivalent to a four-year degree. International applicants for the Traditional MBA must follow the same standards, along with submission of reputable TOEFL, IELTS, or PTE scores and a statement of financial documentation.